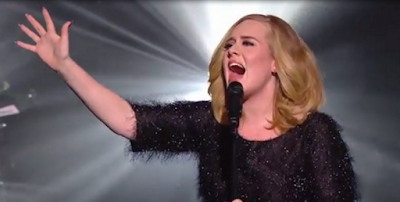 Adele performed her smash hit “Hello” at the NRJ Music Awards in Cannes, France on November 7. Hosted by Graham Norton, the BBC 1 program will air on November 20 – the same day Adele’s third album “25” hits stores. Produced by Greg Kurstin, the project is the follow-up to Adele’s 2011 smash, “21”, which has sold more than 30 million copies worldwide. “Turning 25 was a turning point for me, slap bang in the middle of my twenties. Teetering on the edge of being an old adolescent and a fully-fledged adult, I made the decision to go into becoming who I’m going to be forever without a removal van full of my old junk. I miss everything about my past, the good and the bad, but only because it won’t come back.